Speaking of resolution – having bigger image than your final video allows you also to reframe or zoom your shot without quality loss. It can be useful for some heavy stabilization or more complex transition, like in my Panta Rhei video. Panta Rhei Wrocław from TL video on Vimeo. The last thing related to quality is the ability to shoot RAW. There are tons of advantages of shooting RAW. I know that sometimes people argue whether shoot JPG or RAW, however if you want to shoot timelapse professionally, you’ll shoot RAW 😉 So, one of the advantages of shooting RAW is using the full dynamic range that your camera provides. Of course in video you can get close to that shooting some very flat LOG profile, but now every camera has that option and it’s more complicated. For me one of the biggest advantages of shooting ‘real timelapses’ is that I can stick with the 180 degrees rule with my shutter speed. If you’re not familiar with that rule, check out this article: Cinematic Motion Blur – 180° Rule . The basic idea is to blur things that are moving in the frame (people, cars, water etc.). Adding a motion blur to the timelapse really makes the difference. It’s so important that I wrote specific, in-depth tutorial on this subject – Should you use ND filters? Motion Blur in Timelapse. The other important thing here is that long exposure = better low light 😉 You don’t have to raise up the ISO that much, because you can set longer shutter speed. The amount of collected data can be important for some people. I think it’s more a beginner’s problem, because experienced timelapsers are used to store hundreds or thousands of GB 😉 It’s a little bit tricky topic here – it depends on the interval (the speed of the final video) and whether you shoot RAW or JPG. To simplify, I’ll talk just about RAW data and I’ll compare that to 100Mbps video (the bitrate of GH4). Speeding up video is basically deleting frames. For example if you speed up your video 200%, the software deletes every second frame (or in different words it shows only every second frame). So, making a timelapse from video is just collecting the big amount of data, that you don’t need. The graphs above shows the amount of data that is collected to get a final clip with specific duration. The horizontal axis shows the duration of the final video, the vertical axis is the amount of the data collected. For those who are not very good at math – more to the left – longer final video and higher the line goes, more data is collected. I’ve already mentioned that timelapse from video is just deleting frames. So, faster video equals more data to delete. 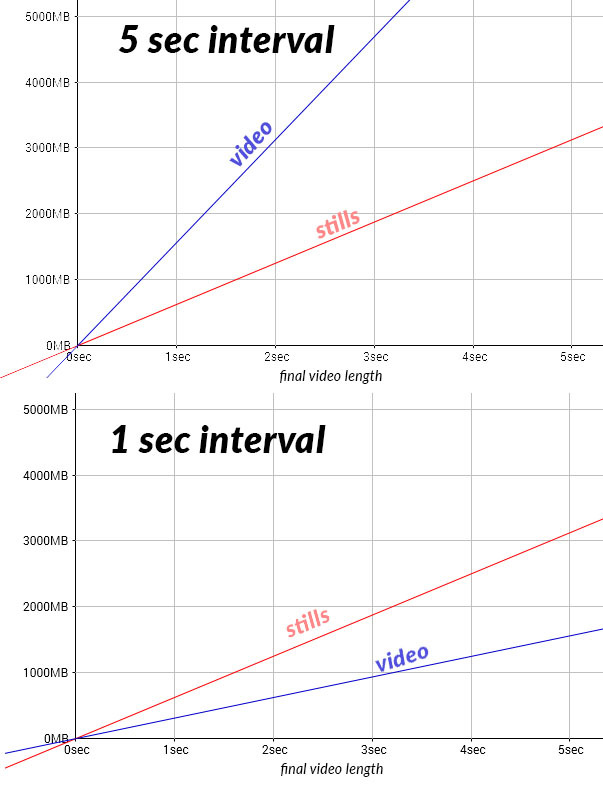 As you can see in the graphs, the amount of data collected in video depends on the desired interval (in speeding up video you don’t set an interval, but it refers to a speed of the final clip). From this graph you should learn one thing – for longer shoots it’s definitely better to shoot stills 😉 Not only you get better quality, but also less data. First of all, beginners often ask which interval should they choose for certain shot. There isn’t one correct answer for that, such knowledge comes with experience. You’ve got to know how the final video would look like and adjust the interval to the specific effect you want to achieve. In video, you choose the speed of the clip in post production and you can modify that as much as you like. Again, someone can ask “Why? Can’t I just speed up the regular 25/30 fps video?”. You won’t get better quality here, however you can get a beautiful motion blur. 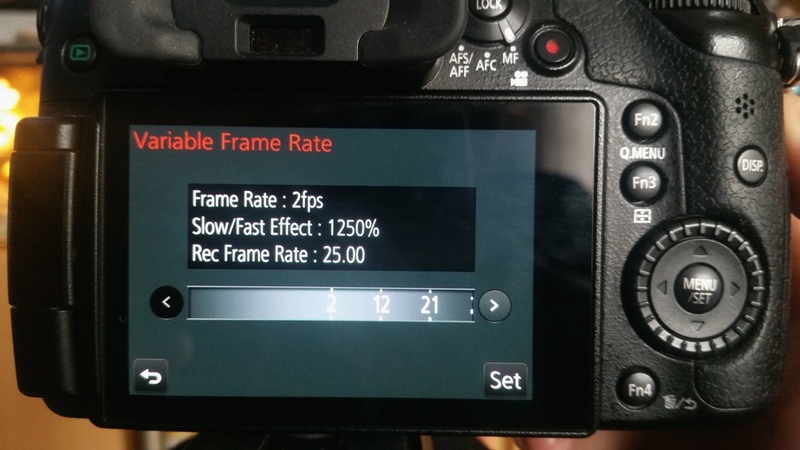 Because it’s a video mode, you can choose even 360 shutter angle (shutter angle explanation article), which is not possible with still phtographs (the camera must have some time to write the picture to the card). For example, if you shoot 2 fps video, you can choose up to 0.5″ shutter speed. In normal video it’s up to 1/24 (at 24 fps). This is very nice feature which I use occasionally with quite good results 🙂 Especially I like to use that with handheld hyperlapses with my gimbal. You can read about that technique here: Handheld Hyperlapse with a Gimbal [VIDEO TUTORIAL]. Long exposure shooting – ability to add much more motion blur & low light shooting. To get notification about new tutorials on my blog, click the little red bell in the bottom left corner. You won’t regret it! Of course it would be best to shoot it in RAW, especially because of the exposure changes. 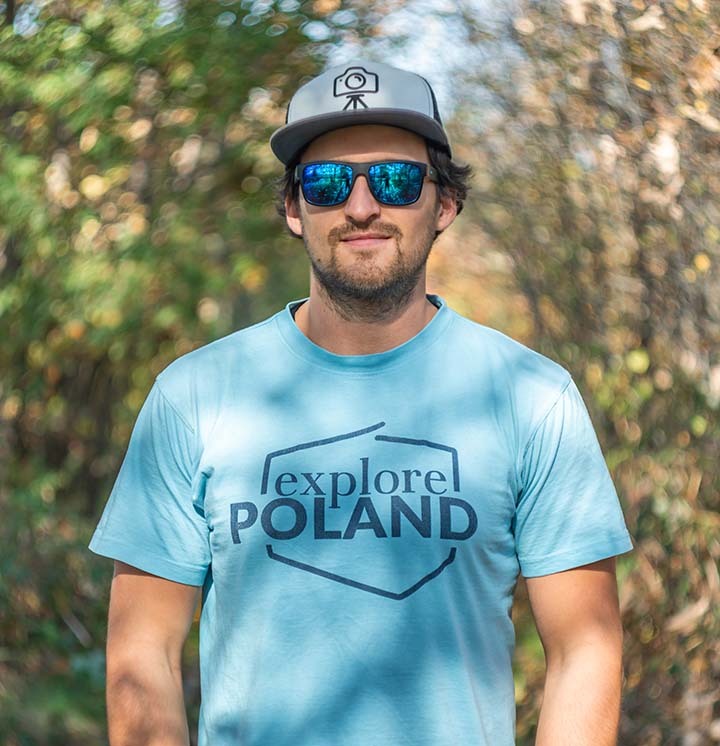 In a dslr I would use holy grail technique, so I would manually change the shutter/aperture. Not sure if it’s possible with gopro, maybe auto shutter would be a good idea. Definitely the exposure settings must be changed if you want to get when everything goes dark. I wouldn’t use auto white balance shooting jpg. It can ruin the shot. For jpg probably better to shoot flat. if you use a tripod it would be better to change just the shutter, not the iso.